A few years ago, I watched a lot of TV shows religiously. I don’t know what got me into it, or how I discovered some of them, but I end up having my hard drive full of shows week after week. One of those shows I liked very much (and was still very sad that it had been cancelled too early) was Pushing Daisies. I wasn’t really much into the characters and I was just mildly intrigued by the story. I think the main reason why I liked that show so much was because of the narrator. If you’re not familiar with the show, think of the movie Matilda. They both have that same, amused sounding narrator that guides you in the story, guiding you with the character’s emotions instead of just letting the actors and actresses show you what they’re feeling. It’s not a sign of bad acting, of course, but a clever way of making the story leave more impact, I suppose. It was exactly that narrator voice that I remembered while reading E. Lockhart’s The Disreputable History of Frankie Landau-Banks. I’ve heard a lot about this book from book blogs, and I was lucky to spot a hardcover copy of this book on the bargain table during one of the Fully Booked sales. This contemporary YA novel tells the story of Frances Rose Landau-Banks, aka Frankie, aka Bunny Rabbit — a 15 year old sophomore in Alabaster Academy. She’s smart, she comes from a rich family and she’s recently grew into her body, earning her a slightly higher physical reputation among the “geeks” that she’s a part of in school. But Frankie is not just a girl. She’s not just Bunny Rabbit. Frankie doesn’t want to be her boyfriend’s arm candy, even if he is popular and adorable and his kisses could make her weak in the knees. Frankie is determined not to be left out, especially by her boyfriend’s all-male secret society (that is not so secret because her father was a member). Thus starts Frankie’s disreputable history. Ah, what a fun novel. I liked how smart this book is, with all its grammar geekiness and social terms such as the panopticon and the existence of secret social societies in boarding schools. I loved the entire Alabaster environment, even if it reeked of rich kids whose connections, not necessarily their skills, will make them powerful in the future. I liked how the story progressed, and how everything connected in the end. Because of the style of narration, I felt like I was one step ahead of the story, and I was able to snicker at how some of the characters were so stupid at how Frankie was duping them all. Frankie and the rest of the characters were fleshed out well, although the way the story was told may hinder the readers from really getting to know the characters. Some people might get turned off with this one, but I liked it. It felt fresh, and despite how the narration kept me at arm’s length with the characters, I still saw them as whole and completely thinking characters. Somehow, the boys in this novel reminded me of the boys in John Green’s Looking for Alaska, sans the massive smoking and more of the geekery. Frankie is such a smart character that I can’t help but wish I was like her when I was younger. 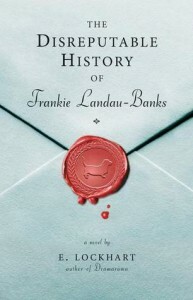 The Disreputable History of Frankie Landau-Banks is a very, very smart novel, and yeah, a bit feminist, but I don’t think guys would not enjoy this one. I had so much fun reading it that even if I was busy, I always made time to read a few pages of it each that. That, and I was very sad to reach the end of it — it felt like it was too soon, but I think the ending was just right for the story. What a lucky find! I’m interested in reading this one as well as E. Lockhart’s Ruby Oliver series because I’ve heard good things about them from book blogger friends. I have got to read Frankie soon! I loved The Boyfriend List by E. Lockhart and met her and she’s awesome. Also, I love that picture from Reasoning With Vampires. I really enjoyed Frankie’s character: witty, articulate, and independent. I really felt like going through my copy and underlining all her comebacks so I could use them on someone else! i love your “no offense anyone” comment. made me LOL. Ahhh, you’ve finally read this! Frankie gets so many high fives it’s not even funny. This one came heavily rec’d by Daisy Whitney. Loved Frankie’s character, her way of thinking, and her obsession with the meaning of words. I haven’t read anything else by E. Lockhart, but definitely will in the future. And man oh man I love that cover. It’s her word-obsession that really got to me. :) A character who has a penchant not just with books or reading but with words is always a good character for me.